BERTO AND HIS SPIDER CRAB. PULPO AND GALICIAN POTATOES FROM A SMALL VILLAGE NEAR THE WINERY. Last year’s offer and blog introduced four friends – Roberto Santana, Alfonso Torrente, Laura Ramos, and José Angél – who met in enology school and formed the brain trust of Envínate in 2005, a relatively cult winery, poised to break on through to the other side. Today the cat is fully out of the bag, as allocations are fought over in nearly every global market. Spanish wine before Envínate never wanted for intensity, but with a countrywide, homogenous diet of heavy extraction, alcohol and new wood, perhaps no winery has sanctified itself so distinctly in the belly of revolution. Their wines are inherently nuanced and transparent, on lighter-weight frames that brim with character and identity. They work exclusively with local grapes, often in field blends, by choice or necessity. As fun as they are dead serious, as down-to-earth as they are intellectual, Envínate wines have a rare bandwidth with consumers and trade alike. Spain seems to take a page out of the Italian playbook, for better or worse, clinging fiercely to decentralization. In my six months living in Pays Basque, I never once heard the Basque language spoken on the French side. In Biarritz, taking a class that teaches Basque is more art appreciation than assimilation, whereas a forty-minute drive into Spain uncovers multiple dialects from town to town. So it is in Catalonia, and nonetheless in Galicia. Alfonso rarely answers a question directly, a classic Galician trait. He will often answer a question with a question or his signature quip, “It’s possible” or “Could be possible.” Luis Gutierrez wrote an entire article on the subject called “Galicia? It Depends!”. What one could infer as cultural indecision, another could choose to call passive exploration, being open enough to examine all sides of a matter before rendering a verdict. Where the downside of such a mentality can seem wishy washy, the freedom to say ‘no’ slowly and ‘yes’ not too quickly, leaves room for change without being blown about by the wind of fad and fashion. Wild land…formidable land…cultivated in antiquity, kept alive by monks, and preserved by families over centuries, to be all but forsaken in the last half of the 20th century by the remnants of Civil War and the subsequent Franco regime. What happened in the last 25 years to turn a failing viticultural region with zero commercial interest into the talk of the town amongst wine aficionados globally? “25 years ago, a great change began in the area, after the emigration of the local population looking for work…” states Pedro Rodríguez. “My parents, Carmen and Manolo, headed one of a few wineries who created Vinos De la Tierra in 1991, predecessor to the current Denomination of Origin.” Five years later, with the help of enologist Luis Buitrón, Vinos de la Tierra would give way to Ribeira Sacra D.O., and Guímaro would become one of 36 wineries to play house; enduring with it, all the growing pains of a region in prepubescence. As the dominant variety in Ribeira Sacra, Mencía is a red grape whose identity, much like Syrah, can shapeshift dramatically, depending on where it is grown and how it is produced. The heavyweight examples in Spanish regions like Bierzo, exalting for their mass and volume, run counterpoint to the fresher, more streamline styles in Ribeira Sacra. With poor soils that are naturally well-irrigated and a cooler climate, Ribeira Sacra Mencía sets itself up to be emasculated, with a unique set of conditions that, even outside the winemaker's hand, create more variation of expression: Which of the 5 sub-regions is Mencía grown in? Does the grape reside on the warmer, south-facing slopes of Amandi, leading to a generally richer style? Or does it find itself on the opposite bank in Ribeiras do Sil, struggling to get ripe? Which soil is Mencía grown in? Is the plot moderated by altitude or does it bake further down, near the reflected light of the river? Is the exposition southeast, ripening more slowly through less late afternoon exposure, or do its sugars concentrate quickly due to southwest exposure? For Envínate, however, “What is Mencía?” plays second fiddle to their core doctrine, “What does the vineyard have to say? It’s a simple set up at the winery; cement tanks and neutral barrels. There’s no store-bought yeast or aggressive extractions here…no fining or filtration…or blowtorch-laden sulfur additions. Rack me once, shame on you. Racking me twice… The point being, if Ribeira Sacra Mencía is transparent, Envínate Mencía is buck naked; not for the purposes of shining a light on Mencía, but rather using the grape, just like any other they cultivate, as a portal to place. A little concept the Spanish call 'terruño' (terroir). On my first trip in May of 2017, I asked Envínate what ‘Lousas’ meant, the Galician word for the local schist soil (broken-up slate). 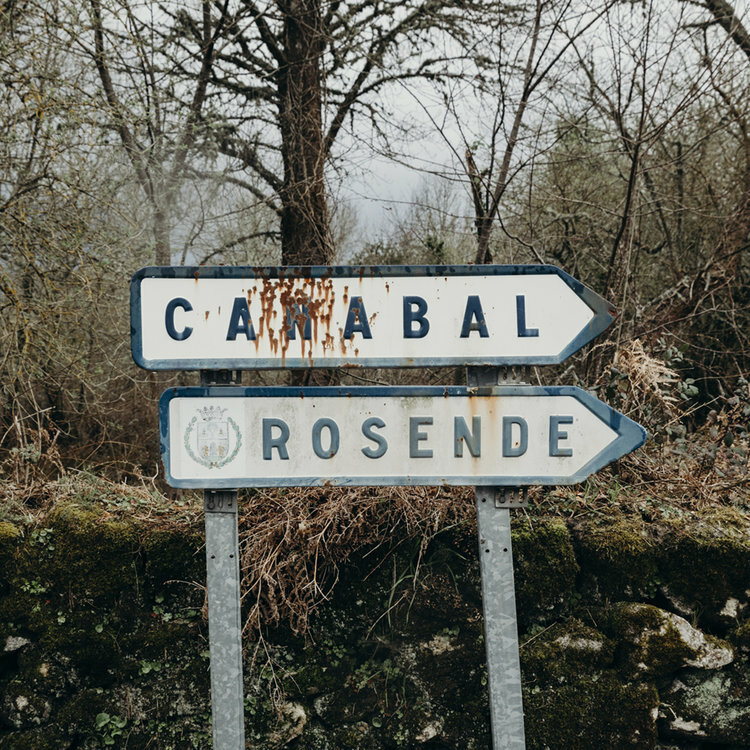 It’s the most obvious word on their Ribeira Sacra wine labels, and if you’ve ever put your nose in a glass, perhaps the most obvious trait in their wines; that is, until I came across a barrel called ‘Rosende’. The Envínate team explained to me that over 85% of the Amandi sub zone is grown on schist, which lends a very specific smokiness and rustic texture. Rosende, by contrast, was ethereal, resembling a silky Burgundy or ultra-classy Fleurie. It was an anomaly in the glass and in the vineyard, where old vine Mencía sits on pure granite.